$27 - Created to impress, this new little girls party dress will do just that! This design is from Petit Lem and is made with sugar & spice, and everything nice! 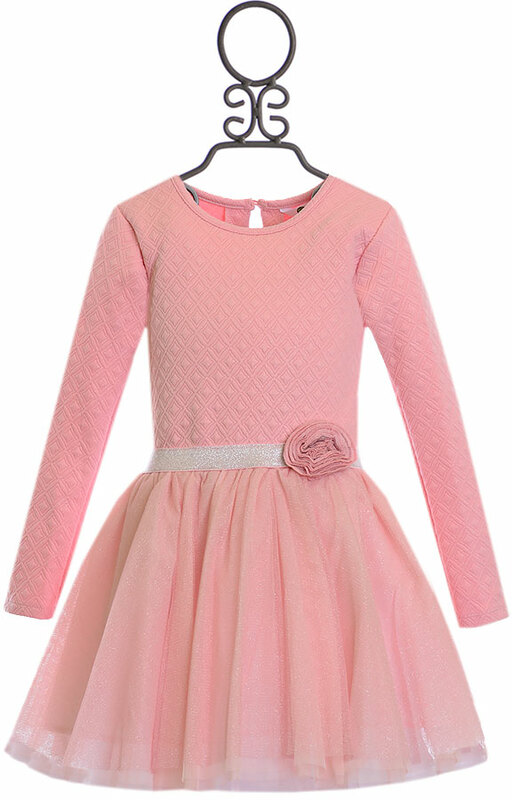 The quilted bodice is a light pink and features long sleeves. We love that this fabric is warm for the chillier days of fall and winter. A single button is fastened above the keyhole on her back. The waist stands out while dressed in a metallic ribbon. An oversized rose is set off to one side. The skirt gains volume with the multiple full circle layers of tulle. The under layers are a light pink while the top features a shimmering dusty rose shade to match the flower. The hem falls slightly lower in the back. Machine Wash Cold Inside Out, Line Dry.